It's not a secret that many sophisticated cross stitch designs are based on famous artwork pieces. Some companies like "Golden Kite" use timeless masterpieces that could be found in the museums and others search works of modern photographers and painters in order to find a good idea for the kit or the pattern. 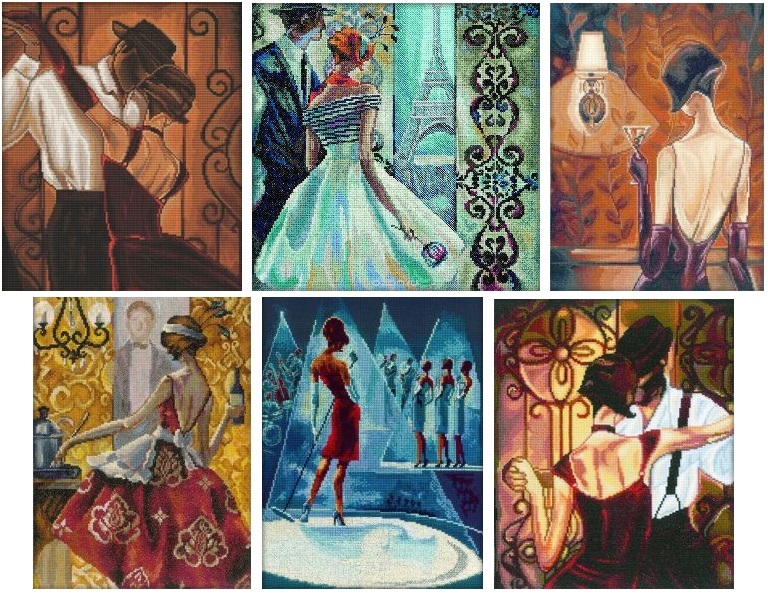 Thanks to RTO, russian manufacturer of cross stitch patterns and kits, I paid attention to Trish Biddle's paintings. I'm not surprised that chic and charm of her works attract so much attention. Signs of Art Deco, bohemian style, romance and dreams of happy rich life... It's what every woman dreams of at least once in a lifetime. Trish Biddle is an American artist, illustrator and textile designer, author of a large number of paintings, including an original retro series about glamorous luxury women. Isn't it fun to dream a bit, imagining yourself as an irresistible movie star or elegant and mysterious lady from high society? Trish Biddle: "Holiday at Franks 1"
Trish Biddle: "Eiffel Tower Red Dress"
Trish Biddle: "Festival of Trees 2"
Trish Biddle: "Lunch at the Louvre"
Trish Biddle: "What Are the Odds"
This page in Russian: "Вышиваем эффектных женщин по картинам Триш Биддл (Trish Biddle)"